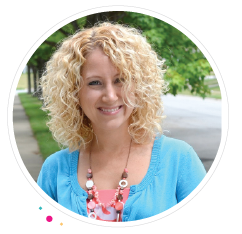 Looking for an easy and delicious breakfast to get you going in the morning? 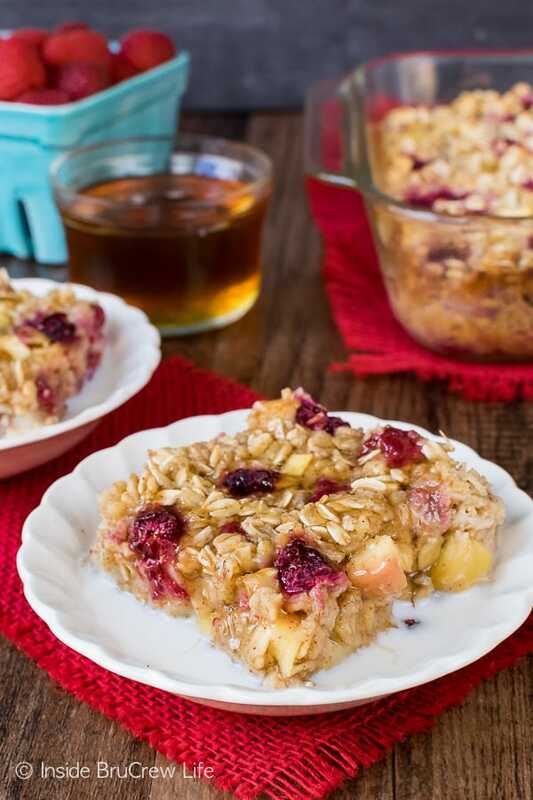 This Raspberry Apple Baked Oatmeal is loaded with fruit and honey, and it’s delicious hot or cold. 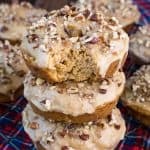 *Sign up for the free BruCrew Life email to have these delicious recipes sent to your inbox when we share a new post. Our kids love the instant cinnamon apple oatmeal packets. Well, they go in spurts with eating it. One month they will eat the entire box in a week or two, then I buy more and they don’t touch it. I should know by now that if they love it this month, that means they don’t want it next month. It must be time to make another batch of double chocolate banana muffins. At least that’s one breakfast that they never pass up. I don’t mind a bowl of warm oatmeal for breakfast, but if I’m being honest I prefer to eat mine baked. There is something so satisfy and delicious about an oatmeal square drowning in milk and honey. Yes, I said drowning. 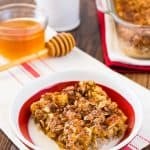 I love to put some milk in the bottom of my bowl and drizzle honey over the top of the warm oatmeal square. 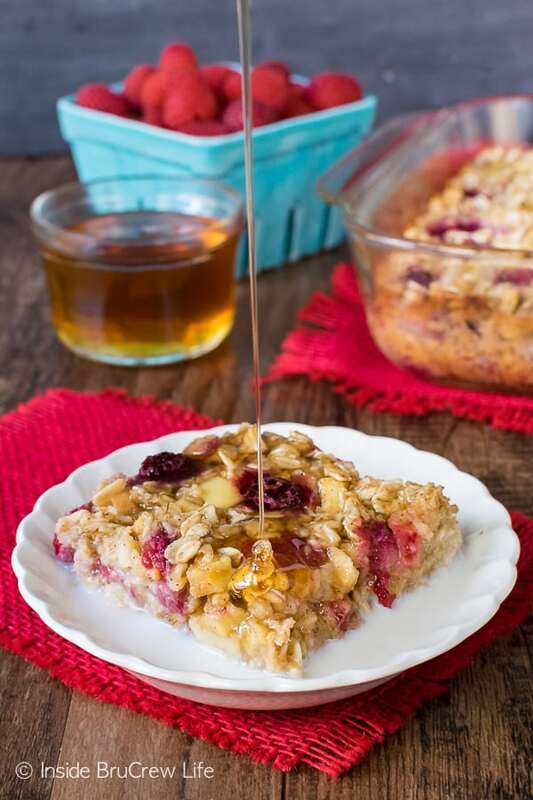 The best thing about baked oatmeal is that you can grab a square of it to go if you don’t have time to sit down for a bowl in the morning. It’s absolutely delicious both ways. 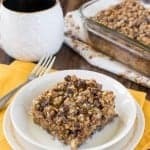 This chocolate chip banana streusel baked oatmeal is my favorite for on the go breakfasts though. It’s kind of like a soft granola bar. The other day I had a few bags of apple slices that I needed to use up because apparently my family is boycotting those right now too. 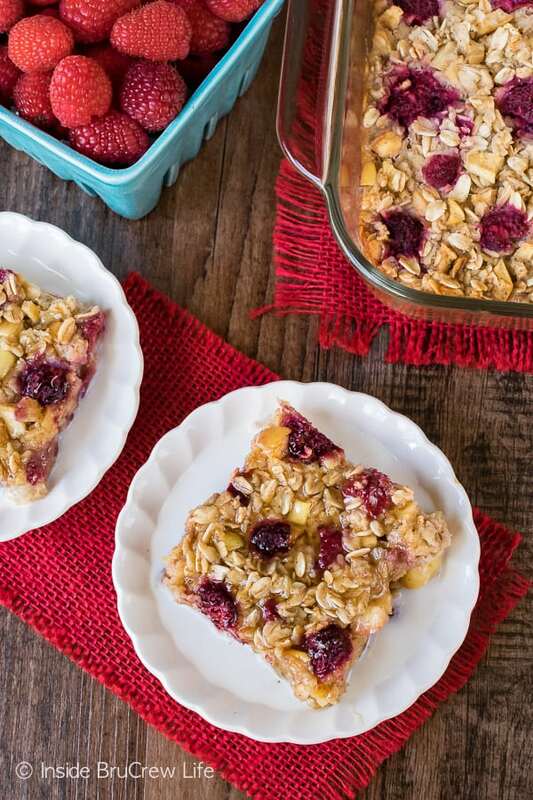 I chopped up some of them and added it to this breakfast bake along with some frozen raspberries because that sounded good to me. The rest of the apples got made into crock pot cinnamon strawberry applesauce. 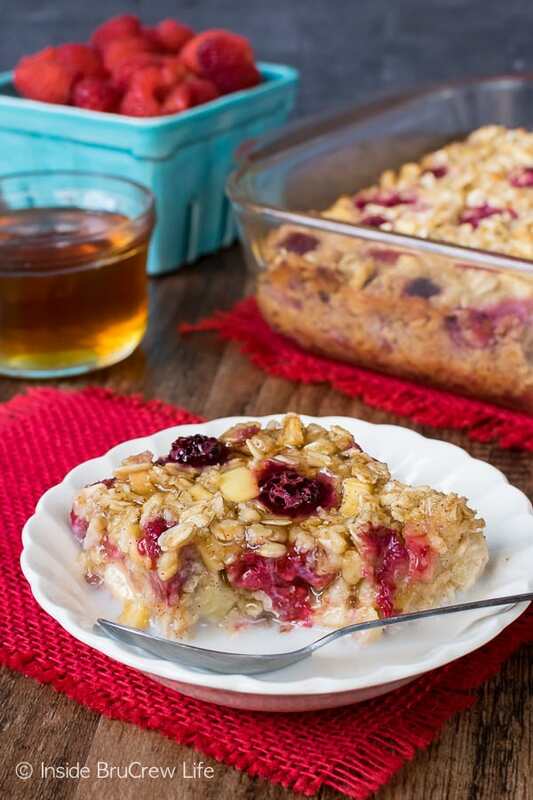 You could really use any frozen fruit you have in your freezer for this raspberry apple baked oatmeal. I’m thinking blackberries would be delicious with the apple too. Mix together all of the wet ingredients first. Stir together the dry ingredients and pour the wet ingredients on top. Add the chopped apples and frozen fruit right before you bake the mixture. Bake it until it is firm and toasty. The longer you bake it, the easier it is to hold like a granola bar. Just don’t over bake it. Enjoy a warm square with milk and honey. It’s delicious! 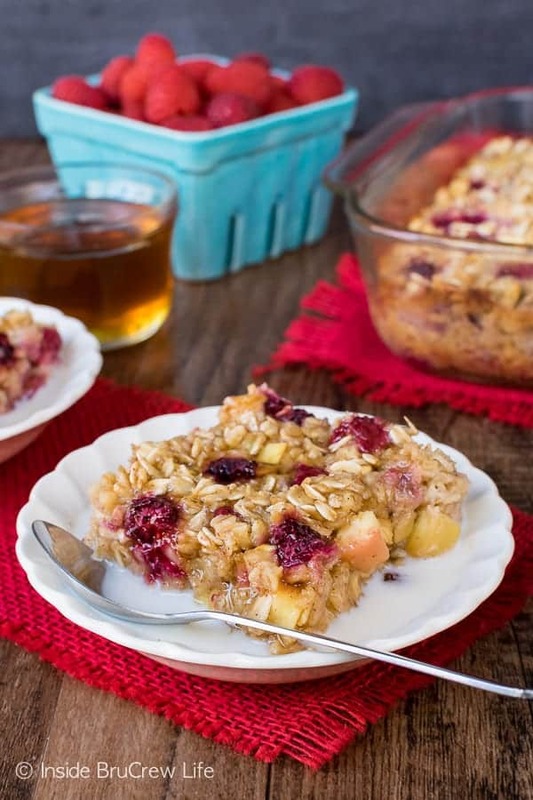 Make sure to head over to Food Fanatic and print this raspberry apple baked oatmeal recipe. 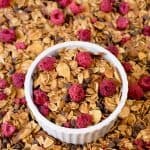 More healthy and delicious breakfast recipes to make ahead of time for the week. 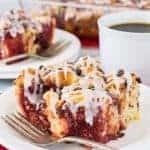 This hearty Fireman’s Overnight Breakfast Casserole from Garnish with Lemon is the perfect breakfast to have ready for busy mornings. 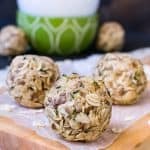 Our kids would love a batch of these Peanut Butter and Oatmeal Breakfast Bars from Your Home Based Mom to grab and go on busy mornings. These Healthy Breakfast Egg Muffins from Well Plated look like a delicious way to get your veggies in for breakfast. 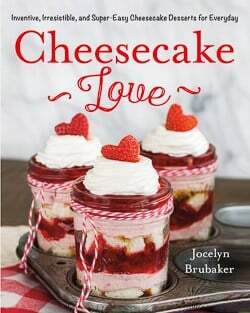 I’m with you, Jocelyn; baked oatmeal is my favorite way to eat oatmeal, too. Can’t wait to try this flavor combo!